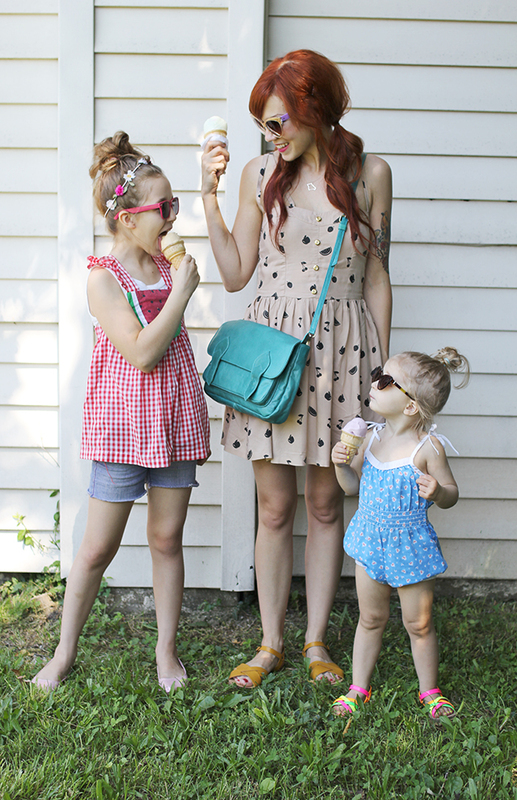 One of our summertime "hobbies" is eating ice cream. That counts as a hobby, right? Last summer we went for ice cream almost everyday... to the point where I had to quit the cream for a bit. We are a family who gets really into whatever we're into. One day I'll tell you about the vacation that made me quit pizza for a few months. Do you have any summer traditions? We seem to have a lot of them! Ice cream sounds so fun. We go for fro yo lots during the summer! My son loves is.. And of course I do too! All of you are soo adorable! Beautiful pictures and children! Love it, looks like tons of fun. I had French Silk ice cream today, actually and it was heavenly! So sweet! (Pun slighty intended). 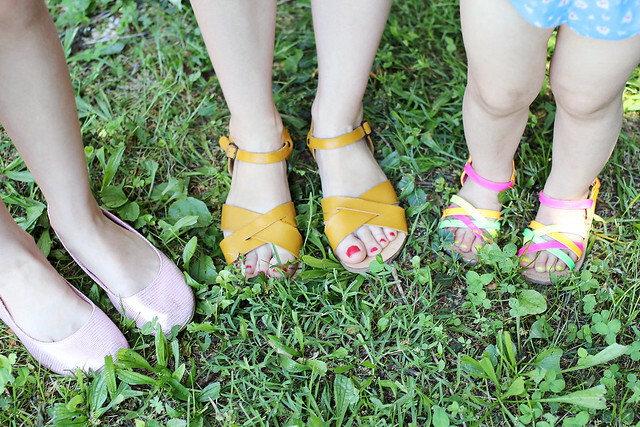 You and your girls have the cutest style! What a lovely mother and daughter time! You three gals have such adorable outfits. Omg ice cream is totally a hobby!! At least I hope so! Hahah I can't wait to hear about the pizza trip! Very cute! I've had to put restrictions on how much ice cream I've been eating lately. It just seems to fit so well with summertime! I'm 25 and have only just decided that I'm finally grown-up enough to have a cone. I love ice cream and I always had to get a cup & spoon cause I eat too slowly and it melts! Your dress is stunning mama!! Of course eating ice cream is a hobby! Summer isn't complete for me without trips to the zoo, picnics, and taking walks with loved ones at dusk. You are all darling! But Poe in those little BonLook glasses--I can't handle it! So cute. I love ice cream too, and could talk about it for hours. :) As for summer traditions, I love to get in lots of swimming and bike riding. And I try to make some kind of jam or preserves - like strawberry or blueberry. Yum. I am LOVING Hope's headband. Did you make it? I wish I had Hopes shirt in my size! 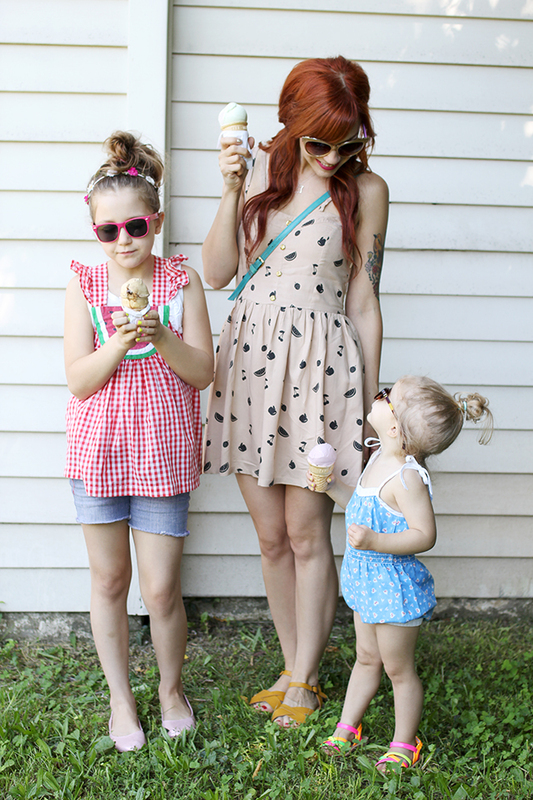 you all look fantastic - perfect summer outfits. 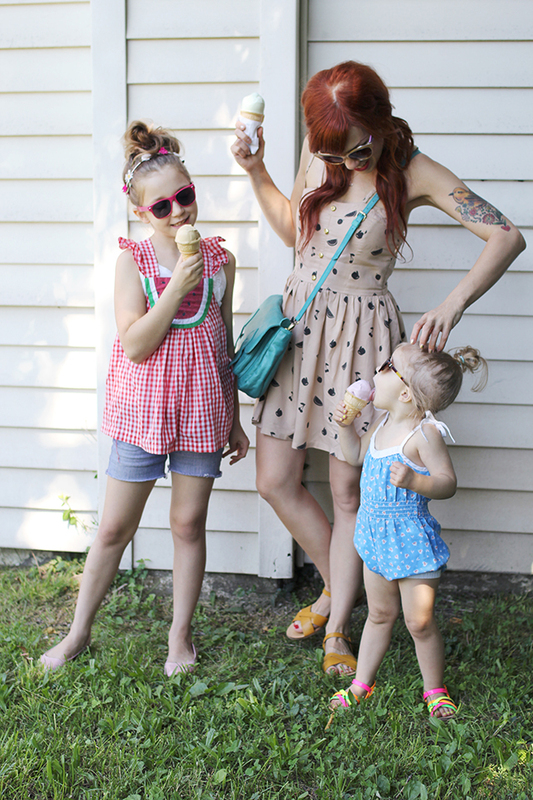 i adore hope's vintage top and poe's vintage romper! 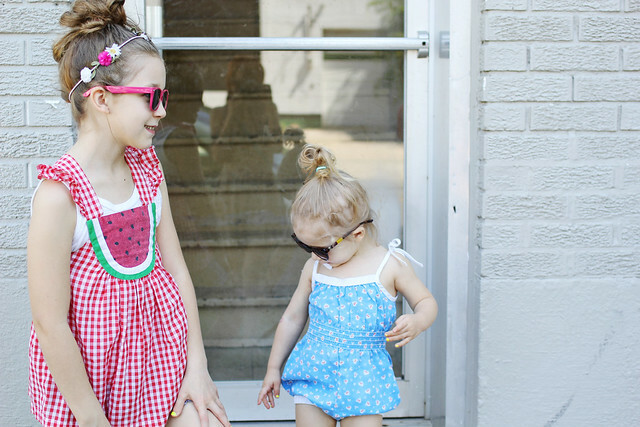 These pictures are adorable - sassy girls comin' at ya! These photos are beyond adorable. And I love that you and your oldest are both wearing fruit-themed clothing! 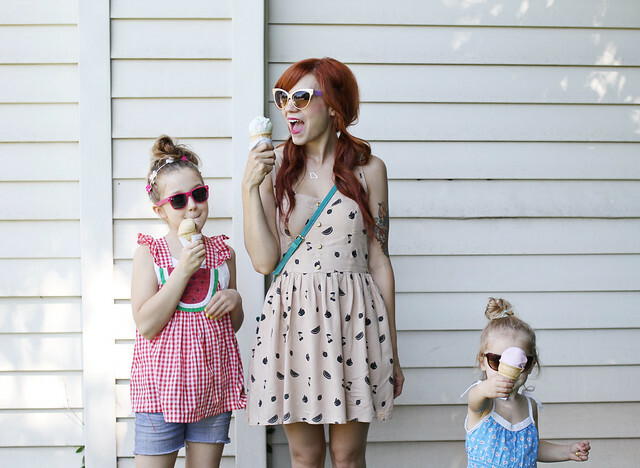 Now I want ice cream :) Such a beautiful family! I'm glad to know that there are other people out there who love ice cream outings as much as my boyfriend and I! It's just so nice to do on a summer night! Aww!! 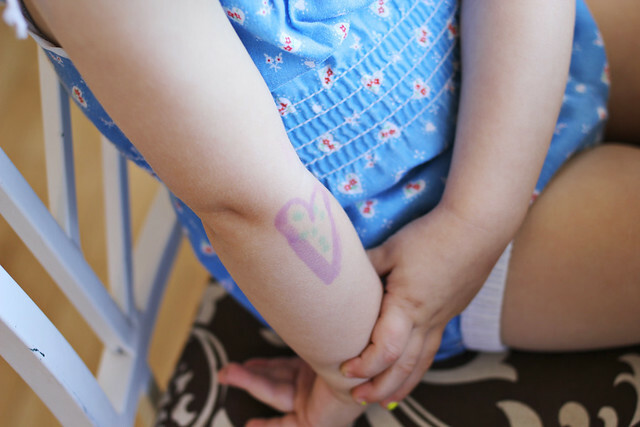 Did Poe give herself a "tattoo" to match yours?! So cute! 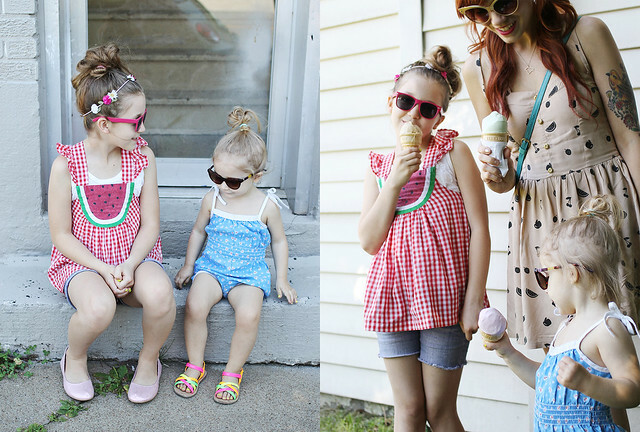 Love these pictures of you and your girls :) My little family (me, the boy, and our puppy) go out for ice cream like its our job. I feel ya, girl! So cute! You are all beautiful. You and your girls are just so cute! I wish I could eat ice cream every day! I am always so tempted by the ice cream truck that practically circles our house. I would whale-out. You guys are super cute! And now I need ice cream! This is so adorable! Your outfits are all adorable! I love the color of your ice cream. I have an internship with my church - we are Brethren and we are REALLY into our ice cream. My housemate and I go get chocolate and peanut butter milkshakes at least once a week. 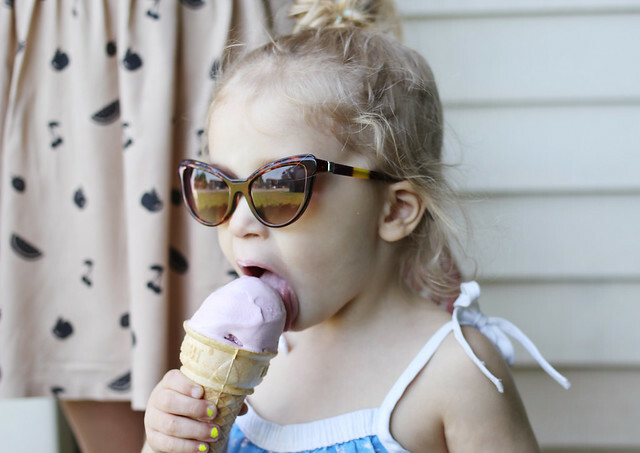 Love ice cream in the summer! During the summer, our nectarine tree EXPLODES with fruit, so everyday my mum and I go out and pick some and make smoothies out of them. It's such a wonderful tradition. Ugh, these pictures are too cute! You seriously have the coolest/cutest girlies. 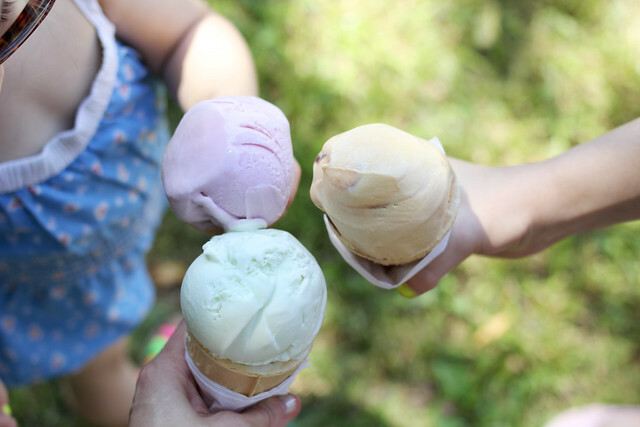 And that ice cream looks delicious, especially the lavender one! Your baby girls are absolutely darling! I love how intensely beautiful your blog is! I'm sure you here this all the time.. but I was just stopping by and fell in love- keep bursting the joy! You are the coolest mom! Our summer traditions (we have a 7-year-old boy) is to go to as many amusement parks and carnivals as possible. We are REALLY into that! And also exploring cemeteries and just generally spending as much time outside as possible because god forbid the sun should ever shine during winter in Pittsburgh!